Twitter is a powerful social networking tool that can help build our brand, our influence and expand our social media reach. This article and video takes a look at the two different thoughts as far as Twitter Strategy – Should we build Twitter big or keep it manageable? Are not using the default egg avatar. No avatar – no follow. Listed a URL in the website space, even another social network will do. Tweet on a regular bases. Are not following a handful of people with thousands of followers. English based account. I can only read English right now. Why are you on Twitter? Your answer might be totally different than mine and that’s fine. We all have different goals and aspirations. Twitter can be an amazing tool for communication, networking, collaboration, customer service, marketing, keep a macro-journal of almost anything, or just to kick back and socialize. Twitter can be useful for research or staying up on the news. I’m actually guilty of Tweeting a link from my phone to “bookmark” it for later when I get home. With so many different uses for Twitter, of course we’ll all use it differently. I actually run many Twitter accounts and some have very different purposes. Your “why” will help you find the best practices for you. I’m on Twitter to expand the social reach of our brand and to interact with our readership, followers, subscribers, viewers, listeners… not to enjoy a personal experience (See Are You Stuck On Social Media Consumer Thinking? for more on that). This is a low life tactic that really shows a lack of character, but it’s been a common practice for many years. It goes like this, they follow as many people as they can and build their following but unfollow everyone later to make themselves look important. This happens in two ways, they either wait until their Twitter following is very high and then mass unfollow everyone or they actually begin unfollowing as soon as the people follow back (See number 5 above). Could you ever trust someone like this PLEASE, don’t risk your reputation by cheating and lying , you’re better than that. Should we build our Twitter following big or should we keep it small and manageable? How can we possibly follow thousands of people on Twitter? Twitter is an awesome social network and their awesomeness allows us to have our cake and eat it too (whatever the hell that means). 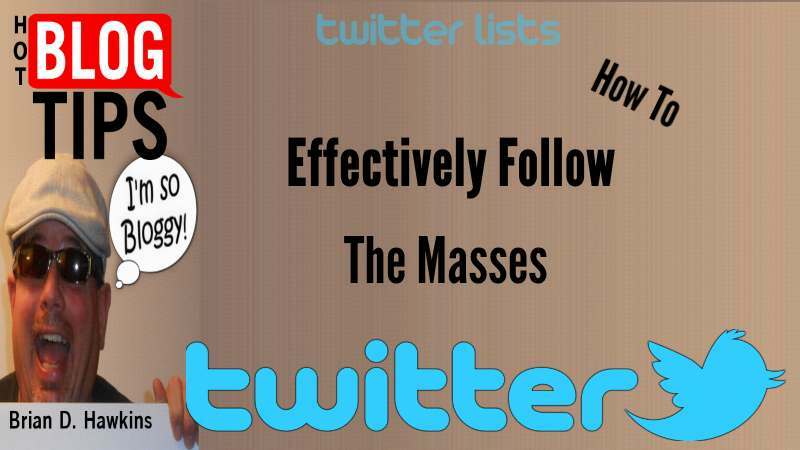 The solution is in creating Twitter lists to follow when you are trying to engage particular groups of people. Twitter lists are a powerful tool and I encourage our readers to take advantage of them if you’re not already doing so. There’s more on Twitter lists in the video below but I’ll give you a couple of examples of recent lists I’ve created for Hot Blog Tips on Twitter. Feel free to follow these lists if you want but don’t forget to create your own. Did you now you can add someone to a Twitter list without directly following that person on Twitter? The actual number of people we’re following on Twitter may have nothing to do with the people we are “actually” following and interacting with. And this doesn’t even take search and hashtags into consideration. Following other people’s list. Did you know you can follow other people’s lists? You Can follow other people’s public lists without actually following the people in that list – or even the person that created the list. Did you know you can create private lists? Yes, you can “privately” create a Twitter list and there’s nothing wrong or shady with that. There can be a number of reasons why creating a list would be better listed privately than publically. The most obvious reason that comes to mind would be a list of competitors in order to keep tabs on what they were up to. Only you and/or your account managers would be able to see those private Twitter lists. Not even those that you added to the list would see it it be aware they were added to it. I have a private list of clients on one of my account so I can keep in touch with them. I do publically follow them but I wanted a list setup so I could could easily check in on them but I didn’t see any reason to make it public since others have no reason to follow that list OR see a list of my clients. The video embedded below isn’t a how-to tutorial, it’s just a short hangout with Sheryl Loch where I explain my way of thinking when it comes to Twitter lists, following too many people and the naysayers. If you agree with my way of thinking and haven’t built your Twitter account yet, decide what your reasons are, set your goals and plan of action as with any task. Create lists for things like your top engagers, top retweeters, top commenters, subscribers, etc.. Check lists your favorite Tweeple have created for inspiration or to follow. Keep in mind, a Twitter list that isn’t used is just a waste of time. Make it a habit of actually using the Twitter lists you make and follow. I know I get a little opinionated at times but don’t let that stop you from disagreeing or expressing your thoughts here, your comments are always welcome. 🙂 Do you use and follow lists? Do you have any Twitter tips or advice for us?